For a man who sells underground lakes for a living, who knows everybody, has a story about everything and a quip as an answer to almost every question – for such a man, Alberto was surprisingly shy when I asked about doing an interview with him. 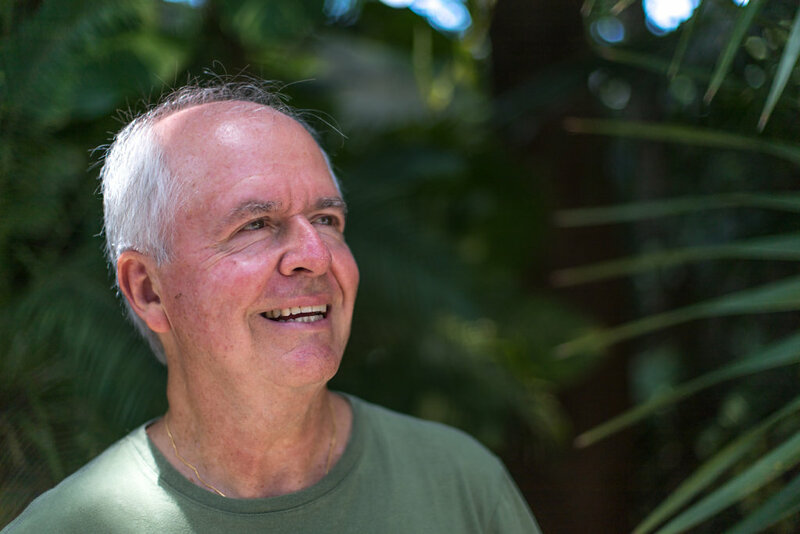 For a man who sells underground lakes for a living, who knows everybody, has a story about everything and a quip as an answer to almost every question – for such a man, Alberto was surprisingly shy when I asked about doing an interview with him. I think it is because he never wanted to be the center of attention. Alberto loves to tell a story more than he loves to be part of that story. He is the the facilitator, not the maestro. But he knows the maestro, enjoys his Mezcal or his paintings – and if all things come together, he sells his cenote to the maestro. Because he is first and foremost: the Cenote Hunter. "I buy and sell cenotes!" 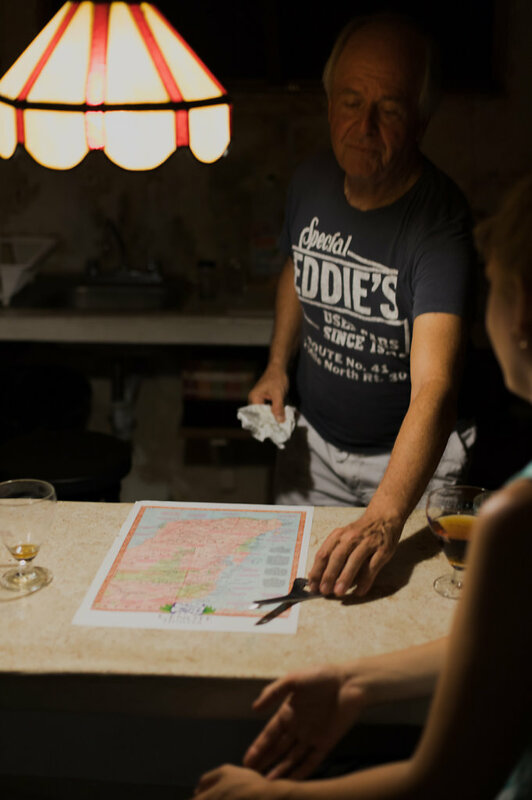 We meet Alberto in our favorite ice cream shop in Valladolid, Wadi Gelato, owned by the Swiss-Mexican couple Nadja and Pablo. While he is talking over some plans for the birthday party of their daughter with Pablo, we are ordering ice cream and chatting with Nadja. When we're all finished with our conversations, happily enjoying the ice cream, he notices the "Köln" printing on our backpacks. After telling us how he got lost in the streets of Cologne one day, I ask what he's doing in Valladolid. "I am checking out cenotes", he tells me. Cenotes are the famous underground lakes, occuring solely on the Yucatecan Peninsula due to the meteoric impact millions of years ago which is also theorized to have been responsible for the extinction of the dinosaurs. Having enjoyed the Zaci cenote in Valladolid the day before, I urge him to visit it. He tells me it's too touristy. He's looking for cenotes that are hidden from the public eye. As a joke, I ask him whether he's a Cenote Hunter, when he exclaims theatrically: "Yes! That's me! That's the name of my website! I buy and sell cenotes!" I need to look over to Pablo to check whether he's making fun of me or not. Pablo seems to have seen that reaction before and nods accordingly. "It's true, wait, I'll show you the website." That's how we meet Alberto. After a second serving of ice cream we cancel our apartment on Isla Mujeres. Alberto's enthusiasm about cenotes is contagious and his offer to give us a free private tour in one of his favorite cenotes is too good to turn down. Plus he knows how to convince a tourist: "You'll see something rarely any tourist, rarely any white person in fact, has seen before." I am hooked. The following night we meet at his place to make plans on which cenote to see and how to get there. Conviently for us his apartment in Valladolid is just on the other side of the Former Convent of San Bernardino de Siena, one of the most famous buildings in Valladolid and the final point of the free walking tour. 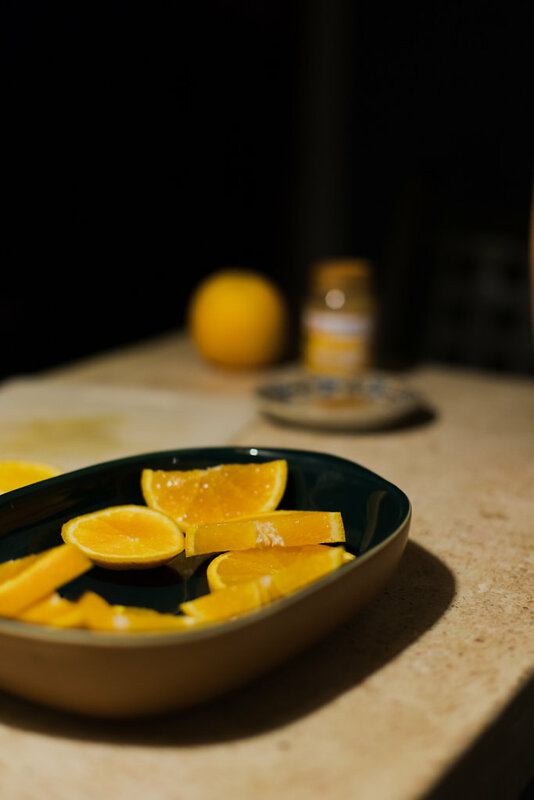 When we arrive at his place, we are greeted with monotonous chorals, given the proximity to the Convent, my first feeling is that a group of monks is practicing their singing before I realize that the sound comes from Alberto's stereo system. He quickly changes the tune to something more modern and shows us around in his apartment, explaining that it used to be a bakery before he had some work done in it. The place feels like a spacious loft if it wasn't for the low ceilings. Alberto shows us a painting from a "famous artist from Chiapas" before he offers us Mezcal from "a friend who destills his own". He is a cheerful host, telling us about his youth in a British boarding school and showing off his parent's bottle opener they got on the Concorde, the discontinued British-French supersonic passenger aircraft. Every few minutes, his mind jumps to yet another thing he wants to show us or to another story he needs to tell, always accompanied with a gesture of surprise, as if he was just as excited about whatever is on his mind as we were going to be. The next day we visit one of Albertos cenotes located a bit outside of Valladolid. After hearing that we have a rental, Alberto takes us up on our offer to use the car to get to the cenote. Once we're close, I realize why: It's way off the beaten path quite literally, the road is full of holes and at one point we need to navigate through waist-high grass. I can virtually can see my security deposit disappearing with each meter we're driving. But it's worth the drive: The cenote is well underground, only accessible through a tiny tunnel, we have to watch out for our heads when accessing it. At first glance the cenote is a bit disappointing, just seemingly black water in a black cave - but then, the sun comes up and through a single hole in the ceiling of the cave a beam of light falls on the surface of the water and we can see right to the bottom of what seems to be a forty meters deep cenote. For a while, we just swim and enjoy the cold water of the untouched cenote, while Claudio, Albertos right hand man, can be heard overhead, rummaging and probably fixing stuff only he knows needs fixing. When I ask Alberto how much a cenote like this goes for he tells me that his current asking price is a million dollars. "But then", he adds: "maybe that price is a sign that I don't really want to sell it. On the other hand, if somebody really wants to buy it ..."
On the way back, I ask Alberto about the interview. His first reaction is - obviously - a joke, about how the Cenote Hunter's fame can't stop growing, but it becomes clear quite soon that he actually doesn't want to be interviewed. It's hard to tell why, given that all I've experienced from him so far was a very outgoing personality. Maybe he wants to remain in the shadows, being able to make the first move on his terms. Maybe he likes to be able to control the conversation, using his jokes and his stories. Or maybe his showmanship is just a front, in the end, to sell underground lakes. Then again, he seems to love every gesture he uses to underscore a little detail in one of his stories and it's hard to see that as just acting for potential buyers of a cenote (however far-fetched that idea is in our case). While I am taking my photos in the cenote, Alberto tells Rebekka a story about how, when his kids told him that he was being an absent father, he decided to pick them up at school the day after - only to find out that he had no idea which school his children went to. 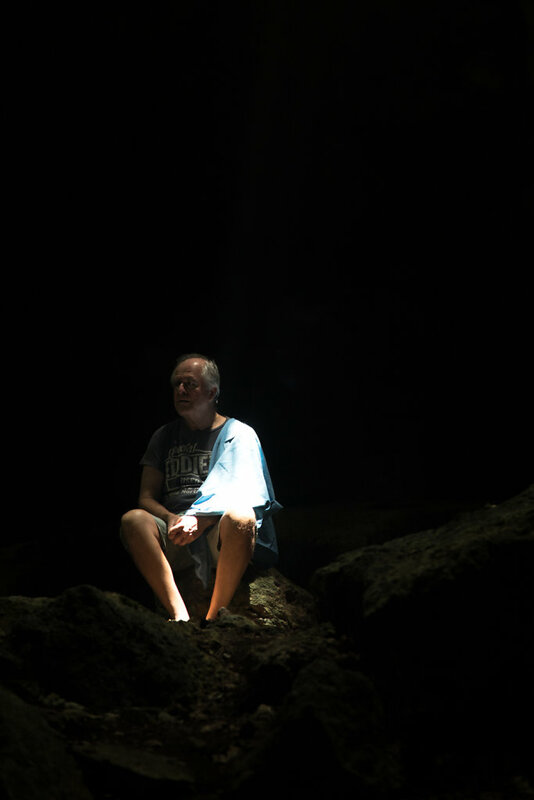 Maybe the cenotes are indeed a special place for him, a place where he can be away from the world for a while, a place where he doesn't have to pretend, where he can stop thinking about stories and stock markets, if even for a little while. After finally convincing Alberto to do the interview, I meet with him in his home in Cancun where Rebekka and I have been staying for a few days via Airbnb. 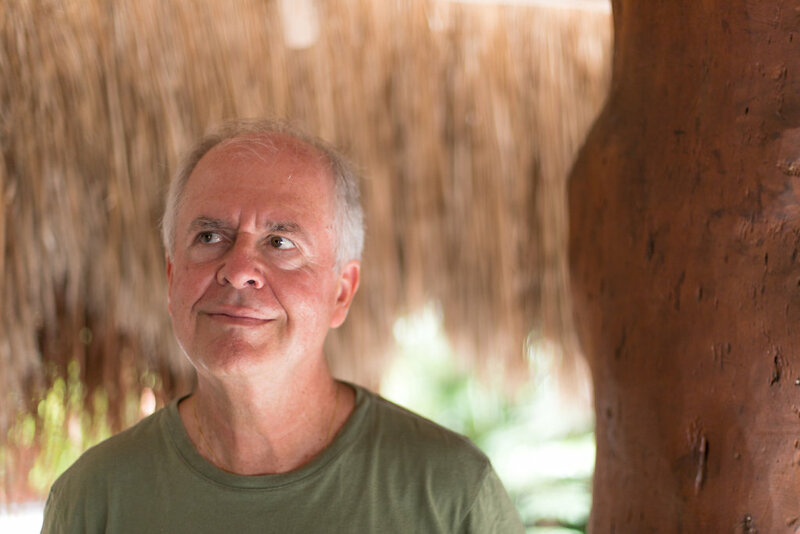 He built the house with his wife Annette, it's a mixture of traditional Mayan architecture with a palmtree roof and more practical elements in a gated community outside of Cancun. Alberto's office is a nice room on top of workshop-slash-garage with the appearance of a small tower. Next to it is the car port with three of his cars, including the used 911 Porsche he bought as a present to himself. Weltkugelschreiber: There's a sign on the wall that says Xcalak. That's where you bought your first property, right? Alberto: I was still living in Mexico City and I knew I had to get away from there. I was thinking for a while to go abroad – but then if you are in a foreign country you're just another foreigner. So I wanted to be in Mexico. And when I talked to my friends, they always mentioned Baja California Sur and some other places in Mexico that I didn't like too much. But the Yucatan Peninsula was always on my mind. I went to the Peninsula every month for a while. Planting little seeds here, little relations there – little by little. And in Xcalak, where Mexico ends and Belize begins, in front of the Carribbean Sea I bought a little part of land. The first one was the hardest. 25 Meters, beach front. I paid 25'000 dollars. I had to sell my wife's car. I had to sell my motorcycle. I had to borrow 80'000 pesos, which took me four years to pay back. But that was the beginning. I learned that when you travel, you usually leave your problems behind. You are different. Making friends with foreigners, the way I see it, is easy. Weltkugelschreiber: ... commuting to Yucatan. Why did you fall in love with the Peninsula? Alberto: Ah! First of all: The sea. Second: The Mayas. The Mayan culture. The Mayan people. The fruits. Even the drinks! I fell in love. And also, I like it a lot that there are many, many foreigners. I learned that when you travel, you usually leave your problems behind. You are different. Making friends with foreigners, the way I see it, is easy. Weltkugelschreiber: There are more foreigners here than in Mexico City? Alberto: By far. I mean, you encounter a lot more. Weltkugelschreiber: When you bought that beach front – that's one meter of beach or how does that work? Alberto: No, no (laughs). It's 25 meters of beach front and the depth was 100 meters. But when I bought it, they didn't care about the depth. They only cared about the beach front. Weltkugelschreiber: You bought that place to live there with your family - for basically the rest of your life. Or at least that's what you thought when you bought it. Alberto: Yeah, for a while. But it was impossible to live there. There were no schools. There were no places to make a living. Being a fisherman is not that easy. And with what you could buy a little, little piece of land in Tulum, you could buy a ranch in Valladolid – with a cenote. Weltkugelschreiber: You actually tried being a fisherman? Alberto: No, not really. I was there. I bought that land. I was going back and forth from Mexico City. And after a while, friends started buying property next to me, at the beach. And people starting offering me land in Xcalak, on the beach front. And wow: I started buying and selling beach property in Xcalak! From Xcalak I moved to Bacalar. From Bacalar, I went to Tulum. And from Tulum, I went to Valladolid. And Valladolid was crowded with cenotes. 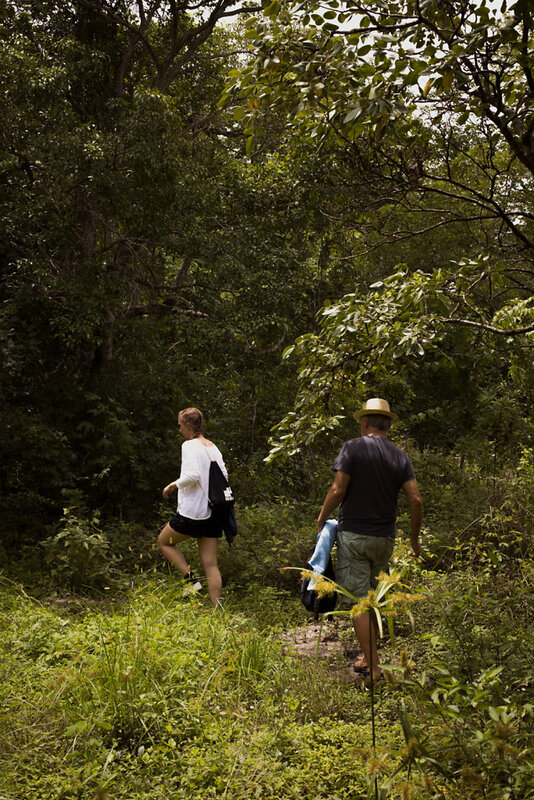 And with what you could buy a little, little piece of land in Tulum, you could buy a ranch in Valladolid – with a cenote. 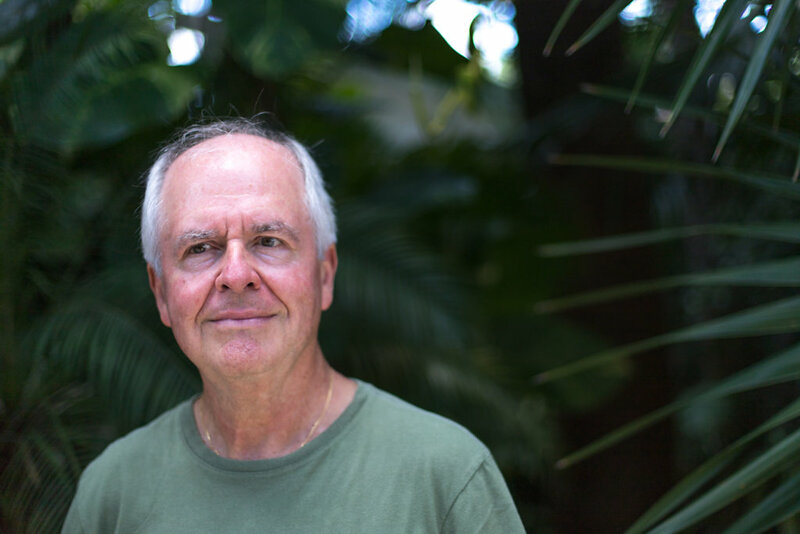 So something felt wrong with buying land in Tulum – and I decided to go for the cheap land, not the expensive land in Tulum. The guy who was selling the land had taken a down payment. So I told him: Listen, I can give you a 150'000 and you can return his 10'000 pesos. But I want it. Badly. Weltkugelschreiber: So you went from selling property at the Carribbean Sea to selling underground lakes. What's a cenote? What are its characteristics? Alberto: Because the Peninsula has no rivers, all the water from the rain goes underneath. And the water, which is acid, dissolves limestone and thus forms cenotes. It may take a hundred or even thousands of years, but it creates these reservoirs underneath the surface of the land. And sometimes the water in a cenote is so clear and pure that you can hardly believe it. Weltkugelschreiber: When did you see your first cenote? And when did you decide that that's something worth – well, hunting? Alberto: After doing some real estate in Xcalak, I somehow managed to get some money and I was building a house in Cancun. Finallly! I was about to build a swimming pool but then I met this taxi driver. He told me that there was this piece of land in Valladolid with a cenote, and he told me that if he had the money, he would buy it immediately. I was like: "What, really?!" I told the taxi driver: Please, take me there! Three days later, he took me all the way to Pakam. The guy who was selling the land, he had an agreement with somebody and he had taken 10'000 pesos as a down payment for a total price of 70'000 pesos. So I told him: Listen, I can give you a 150'000 and you can return his 10'000. But I want it. Badly. Weltkugelschreiber: So you went there, saw the cenote and decided "I want that". What fascinated you so much? Alberto: The thing is that this cenote was a closed cenote. It could've been only the mouth of a water well. In order to make sure it really was a cenote, I wanted to go down. So the owner, along with his son, let me down with a piece a rope. Like four or five meters. And then I saw the – how do you call it? The ceiling of the cenote. And I said "Jesus, this is a cenote. Not a well." And I called him: "This is enough, bring me up." But they couldn't, because I was too heavy. They couldn't lift me up. But with the help of my friend Claudio, my right hand man, they managed. And yeah, Claudio will regret that moment for the rest of his life. (laughs) No, he's been working for me ever since. Weltkugelschreiber: How long have you been working together? Alberto: Jesus. He's bad with dates, but I'm worse. At least ten years. After buying my first cenote, he showed me one or two cenotes. And at the beginning, he helped me out finding cenotes. After that, it was a job for both of us. And now he looks after the cenotes, but mostly he can navigate in the jungle. He gets lost in the city of Mérida or Cancun really, really easy. I get lost in the jungle really, really easy. But he doesn't. So his job is to maintain the cenotes but also to navigate in the jungle. I bought my first cenote and because of that I couldn't build my swimming pool. And when I was about to build the swimming pool for the second time, I bought another cenote. Weltkugelschreiber: So you found your first cenote because a taxi driver told you about a piece of land. And you bought it. And then, on some level, you made the decision that one cenote isn't enough. You wanted to be the Cenote Hunter. You wanted to be the guy who buys and sells cenotes. Alberto: Well, the truth is: I bought my first cenote and because of that I couldn't build my swimming pool. And when I was about to build the swimming pool for the second time, I bought another cenote. I was gonna build the pool, but I couldn't resist buying the cenote. It was like a calling. Even if I had no money I wouldn't stop, I would borrow the money or somehow get it. Somehow. 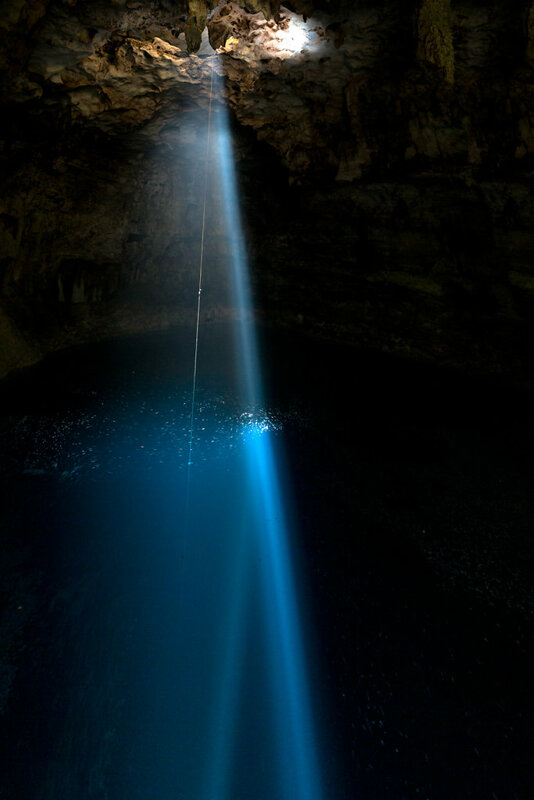 Weltkugelschreiber: You have 22 cenotes right now. If somebody went up to you and said, here's the 23rd, you'd buy it? Even though you have 22 cenotes you need to sell? Alberto: Jesus. I don't take good care of any of those. It's too much. Some of them are far away and I visit them once a year. Some of them have wasps where they shouldn't be. Some of them have ants where they shouldn't be. We need to man the fences to try to preserve it, to get the hunters away from there. Weltkugelschreiber: Hunters? Like hunters that kill animals? Alberto: Yeah, deer hunters, whatever. Sometimes they kill anything that moves. It's so stupid. Weltkugelschreiber: I wanted to ask you about preservation. You want to preserve cenotes. What are the dangers for a cenote? How do you want to preserve them? Alberto: There are some cenotes that get filled with tourists from busses every day. Little by little, they deteriorate. I don't know, we humans, we are a plague. Too many of us always destroy things. So the idea is to preserve by not opening the cenote for too many people to go there, to swim, to eat nearby or whatever. And also, and most important is to teach the new generations about how to preserve it, how to take care for it. Nowadays, I don't want to find a buyer of a cenote. I want to find someone who looks after it. And if I can make a buck or two – that would be great. A lot of people don't realize that a piece of land with a cenote can be bought. Weltkugelschreiber: Sounds about right. You seem to me like a guy who doesn't say: "Ah, that could go wrong" you are more like "Hey, that could work out" – is that true? Alberto: Gee. Yeah, I'm optimistic and most of the time, I do what I want. And there are days, or weeks in which everything goes the way I want it to. But sometimes nothing works properly. And that's when I get mad. But yeah, I know that sooner or later things will go the way they should. The world is not a perfect place, but still, we need to make it better. I think that eventually, something is going to happen. 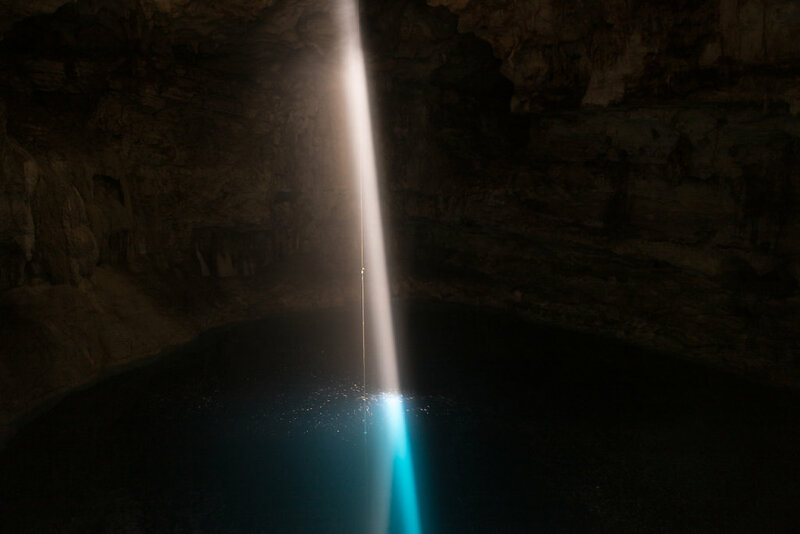 Maybe with a famous artist or a huge movie star; something is going to happen that will bring the attention to the cenotes. A lot of people don't realize that a piece of land with a cenote can be bought. So eventually I would love to sell all of my cenotes but one. Because I would love to have only one to really, really take care of. Weltkugelschreiber: Which one would you like to keep? Which cenote? Alberto: That's something ... that's something that I haven't managed to decide yet. You should go and check them out. All of them! And help me to decide. Weltkugelschreiber: I would love that. Something tells me that I'll be back. And maybe by then you will only have one left. Alberto: Yeah. That would be great. If you want to read more about our time in Yucatan (in German though, sorry folks), click here or feel free to browse this website!